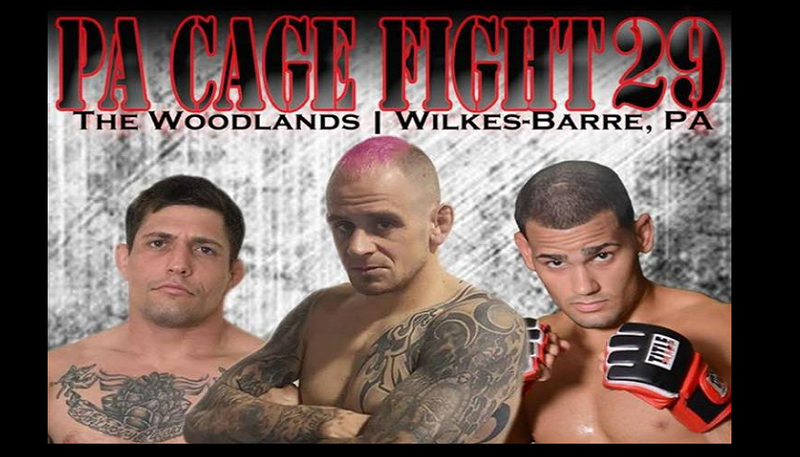 PA Cage Fight 29 took place at the Woodlands in Wilkes-Barre, PA, September 22. In the main event, Sean “Shorty Rock” Santella set out to earn a third flyweight title as he took on Nathan “Teddy Bear” Williams. Santella already holds the Cage Fury Fighting Champions and the V3 Fights flyweight titles. In the evening’s co-main event, bantamweight champion Jordan Morales defended his strap against challenger Tony Gravely. Steffen Yaskoweak opened up the evening’s fight card with a first round TKO over his opponent, Bobby Shinko. Yaskoweak clipped and dropped Shinko on his behind. Shinko appeared to have collected himself back together when Yaskoweak connected with another left hand dropping Shkino face first to the canvas before referee Jimmy Chappell rushed in to call an end to the contest. 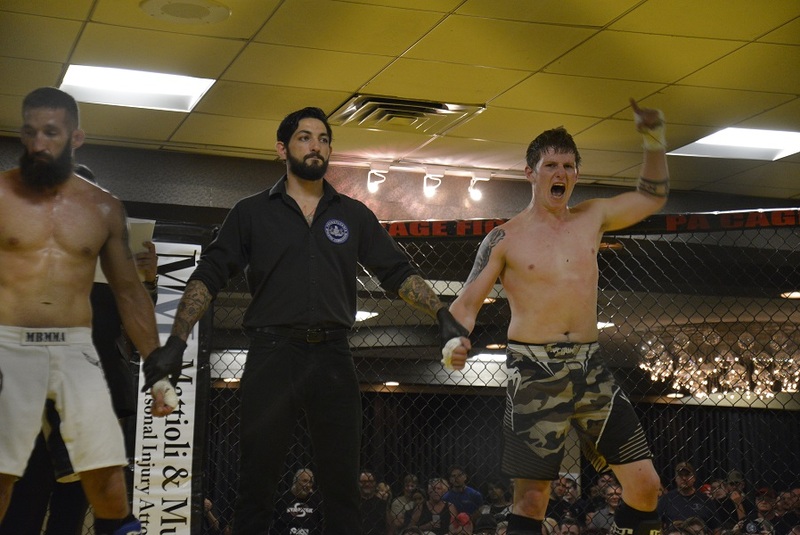 Noel Irizarry and Robert Bozek each had their opponents drop during fight week and the two warriors opted to face one another inside the PA Cage Fight cage. Unfortunately for the 37-year old Bozek, he could not keep Irizarry from peppering him with the jab. Bozek became visibly frustrated and hurt and it was only seconds later that Irizarry connected with a big right hand that dropped him, resulting in a knockout and victory for Irizarry. There was a slight delay in the action as fans had to wait for an ambulance to return to the Woodlands after Keman Jackson had to be transported to a nearby hospital for a leg injury during his fight with Michael Dessino. Once the action resumed Austin Saxer and Frank Wallace went to battle. Saxer locked in a tight triangle choke in the round but Wallace fought through and was able to get the submission loosened as he landed hard body shots to his opponent. This contest would be the first of the night to see a second round. Wallace was able to secure side control in the second and land a few knees to the body. The contest will now move to the third and final round. After a few shots were thrown at Wallace to open up the final frame he took the fight to the ground where the two men went back and forth for control. This one goes to the judges’ scorecards for a decision and Saxer earns a split decision victory. Collin Sharpe vs. Ryan Rizco followed the exciting Saxer vs. Wallace contest and this one picked up right where the other one left off. Rizco landed a big slam early in the opening frame which enabled him to maneuver to side control where he worked for the arm. Once the arm submission was no longer available Rizco grabbed hold of the neck and that was all she wrote. Rizco wins via first round guillotine choke submission. Joe Tizzano of Miller Brothers Academy challenged Tyler Feist for his PA Cage Fight featherweight strap. Tizzano came out like a beast hurting the champion with strikes early on. From there the fight pressed up against the cage where the dog fight would continue before the bell sounded signifying the end to the round. In between frames both Dan and Jim Miller provided instructions to their fighter and boy did he listen. Tizzano poured on the pressure in second round, landing hard unanswered shots before the referee called an end to the contest. We have a new champion. Another Miller Brothers MMA Academy prospect, James Fitzpatrick, claimed gold tonight as he locked on an armbar that might have snapped Omar Kellom’s arm in half. Fitzpatrick claims the PA Cage Fight interim lightweight title and will likely challenge champion, Ronnie Lavigne, down the road. 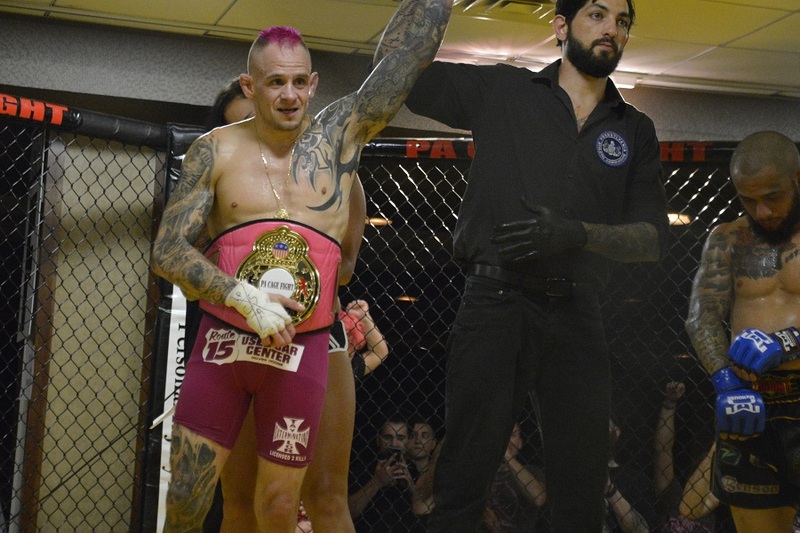 Aaron Kennedy and Solo Hatley fought for the PA Cage Fight amateur bantamweight title. Kennedy brought a strong wrestling pedigree into the fight, able to shoot from all the way across the cage. He also was positioned as the number one amateur bantamweight in Pennsylvania, but Hatley who flew in from Arkansas on the day of weigh-ins to take the fight on short notice would not go down easy. One mistake in the second round may have cost him the fight. Kennedy went to turn “Hatley over but wasn’t able to complete the maneuver from his knees and Hatley took his back. From there Hatley got his hooks in and worked the rear-naked choke and also strikes to the head. The round would end and Kennedy survived for a third round. 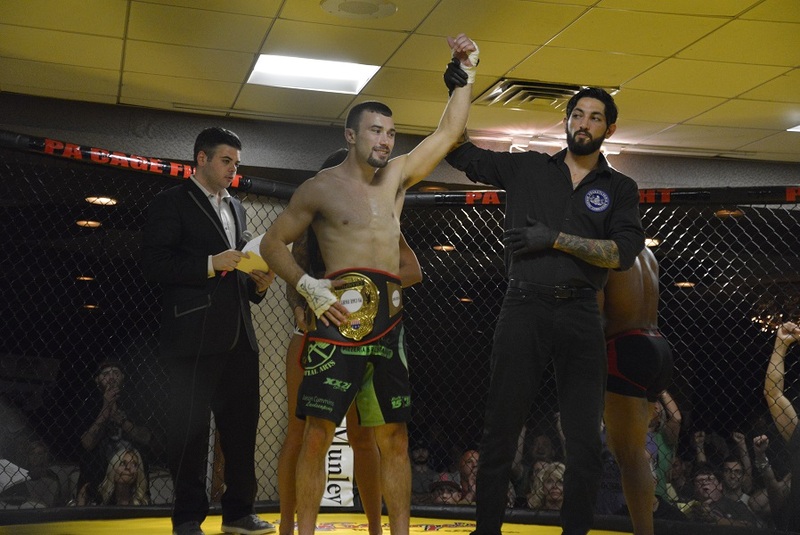 In the third round Hatley continued to pour it on the wrestling standout and would become the new PA Cage Fight amateur bantamweight champion with a unanimous decision win. Mike Pagano and Jake Kozorosky fought in the first professional bout of the evening. The taller Kozorosky caught Pagano with a shot early on and Pagano looked to take the fight to the ground. Pagano exerted a lot of energy but got the fight to the mat. Once there referee Jimmy Chappell temporarily halted the fight for a doctor to examine Pagano who was leaking blood from the region around his left eye. 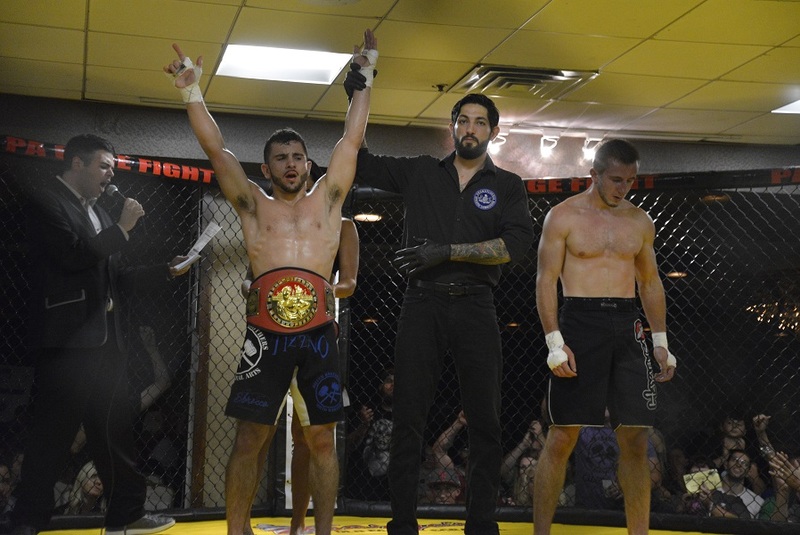 After being cleared to fight, the contest continued but Kozorosky stayed relentless in the attack and the fight came to a close via TKO in the first round. After the victory, Kozorosky’s coach came into the cage to promote him to a BJJ purple belt. 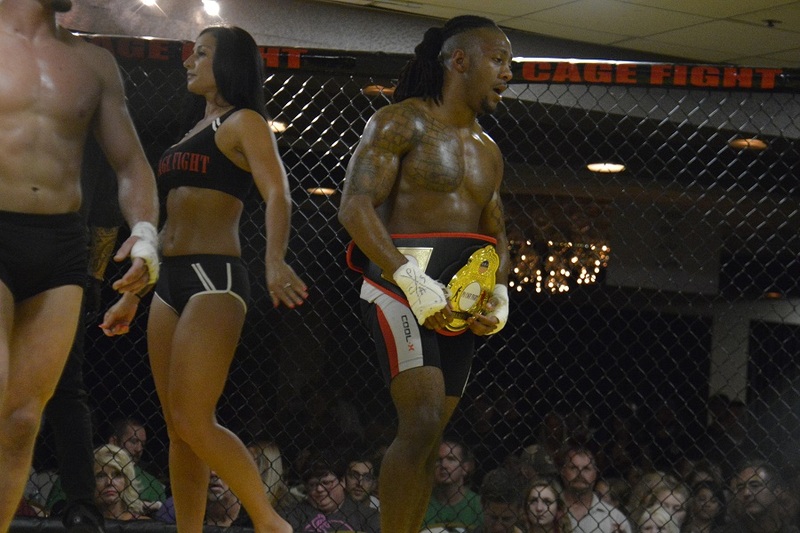 Jordan Morales and Tony Gravely met in the center of the cage for the PA Cage Fight bantamweight title. Right away a slam allowed Morales to cinch in a tight guillotine choke. It looked as if the fight would be over in a matter of seconds. Gravely maneuvered his way out and put the champion in a moment of danger. Morales survived and against worked for a guillotine but Gravely slammed his way back down to the ground where he would take back control. Once again Morales would go for the guillotine when the opportunity arose, but just as before Gravely picked him up and slammed him. The hands would fly in the second round but the tricky Gravely again worked his slams to dictate the fight down to the ground. Morales continued to lock in his guillotine choke every chance he got. The round closed with Gravely having back control and Morales landing elbows from the back. The crowd is chanting for Morales to do something spectacular and win the third and final round and the fight. He lands a few shots which Gravely didn’t like so Gravely takes the fight to the ground. Morales works his way up and the hands fly, but not for long. Gravely against takes the fight to the mat and presses Morales up against the cage. The fight goes the distance with Gravely winning unanimously on the scorecards and taking the bantamweight strap. In the evening’s main event, a fight for the inaugural PA Cage Fight flyweight champion. Nathan Williams, a Bellator veteran and number one-ranked flyweight in midwest, took on the number one ranked flyweight outside the UFC, Sean “Shorty Rock” Santella. This was a fight. In the opening round Santella and Williams duked it out on the feet. When the fight went to the ground, “Shorty Rock” applied an armbar so deep I had to look away. It is a miracle that Williams’ arm did not snap into pieces. The fight continued on and the round ended with Santella on top landing ground and pound to his opponent. Williams did a fantastic job in the butterfly guard in the second round, keeping Santella at bay. Every time Santella tried to hop over into side control Williams denied him. Santella eventually found a way to sneak in and took the back of “Teddy Bear” and locked in a rear-naked choke. The hold was tight and as Santella moved Williams away from the cage, Williams found a way out and got on top. The round ended a few seconds shorter than it was supposed to as there was miscommunication between the referee and time keeper. Williams was visibly upset by this. The third round began and Santella dropped Williams with a shot and took his back and locked in a rear-naked choke to claim his third flyweight title. “Dana White…. sign ‘Shorty Rock’ Sean Santella,” fight promoter Paul Matraselva Jr., said immediately following the fight. He is absolutely right.